We have included answers to commonly asked questions below. However if you have anything further you want to know, please feel free to get in touch. My Locum Manager was built for locums, by locums. My name is Dr Matthew Beddoe. I created MyLocumManager with a team of locum doctors who are passionate about saving locums time and money. We all know as locums that admin related to job bookings, invoicing and pensions quickly builds up and is often difficult to manage quickly and efficiently. You often have to set aside additional time to chase payments, track unpaid invoices and prepare your annual accounts, which can be time consuming and stressful. 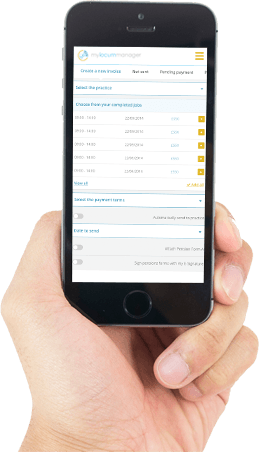 I got together with a team of locums and we have created a website that will manage all aspects of your locum work and finances in an intuitive, virtually paperless and automatic way. My aim with this website is to save you time and money. What are the benefits of using MyLocumManager? We have created smart, easy to use technological solutions for your invoicing, pension forms and tax data. If you want to manage your admin in seconds from anywhere then MyLocumManager is for you! Our site is optimised for use on smartphones and tablets for easy use on the go. Want to start locum work but don't know where to start? Our free resources section offers advice on setting locum rates, booking sessions and much more. We also offer templates for your CV and locum terms and conditions to help you get started. How much does MyLocumManager cost? We offer a free 3 month no obligation trial. After the trial the site costs just £12 per month. This cost is tax deductible, and automatically added to your expense tracker. If for any reason you want to take a break from locum work you can pause your membership in one easy step. How do I add the web-app to my home screen? It's simple to add the MyLocumManager web app to your mobile device. Just click 'add to homescreen' on your internet browser. All of your data is stored securely and fully encrypted, only accessible by you. We do not reuse or sell your data for any reason, nor do we share any information with third parties. How do I sync my calendar with my smartphone or tablet?